Francine's Friends: Vote for Francine's Friends Display Window at Glenbrook and Help Us Win $200! Vote for Francine's Friends Display Window at Glenbrook and Help Us Win $200! 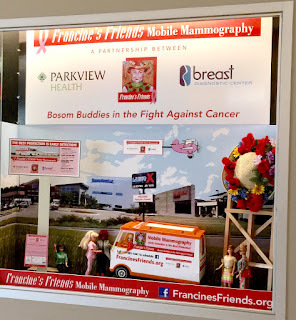 Francine's Friends had the opportunity to put up a window display at Glenbrook Square the month of August promoting mobile mammography and early detection and would like to extend its publicity life on the website and get a chance to win $200 for Francine’s Friends. All we need is your vote! There are no forms to fill out, no contact information, or cookies are collected. Simply hit the vote button by our window display (click here for direct access), or visit at fwevent.com, then click on “window contest” at top. If you want to see the window in person, it's just inside the mall entrance by Red Robin. Thank you for your support! And thank you to Carson's for making the opportunity to promote nonprofits possible each month. You are a wonderful community partner!